My love for makeup is very recent hence I am still in phase of evolution. Initially my makeup was limited to use of BB creams/Sunscreen/Moisturizer, Compact Powder, kajal and lipstick. As now I know the importance of various products from many You tubers, I feel the need of products like concealer, highlighter, contour, blush and many more. But as I am not very proficient to use high end/ pricey products for the purpose of conceal, highlight and contour, I was in search of some budget product which I can use for practicing and learning. While going through my search online, I found the brand named Kiss beauty. This brand is exported by Shantou Yingji cosmetics factory to different parts of world and is available online on Amazon, Flipkart and many more online shopping websites. All round Contour made too stay highlighter. To stay highlighter professional makeup 12 color concealer palette make up flawless lasting. Professional Contour highlighter made to stay highlighter. 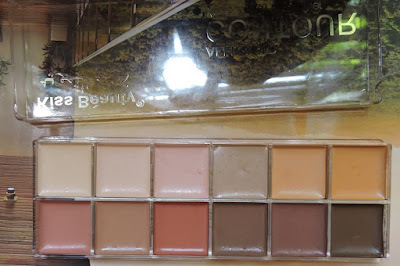 The packaging of the palette is very simple and is not travel friendly but still I like the way the product are placed in small squares in the palette; I find it very cute. The product comes in slim rectangular body with 12 shades places in squares in two rows of six each. The top lid of the box is transparent which gives a look of the shades, but the lid is a not very tight, hence it may open in the travel bag. As this product is 3 in 1, I wanted it to be travel friendly so as I can carry it along with me. Also, the product is not accompanied by any applicator i.e. one will have to dip finger in the product and blend with fingers or our own blender. Overall considering the pricing the product is fairly packaged and looks good. There are total 12 shades in the palette which are mix of Concealer, Contour, Highlights and corrector. The shades are not placed in any order and hence one has to identify which color will suit oneself as concealer, contour and highlight. Shade 1-3 : These shades are highlighting shades which will suit all skin tones. Shade 4-6 : These shades are concealer shades. Shade 10-12 : These are contour shades. All the shades are very creamy and blend able. The shades spread easily on the face and show up very well on the skin. The longevity of the shades is less but they have decent payoff. This palette is good to find which shade and texture will match skin tone perfectly and look good. Shade 1: I use this shade to highlight my under eye areas and all the high points of face. Shade 2: I use this shade on my eye lid as eye shadow base as my eye lids are pigmented. Shade 3: This shade has a pink tone to it, I have not used this shade till date, but i think I might use it on my eye lids. Shade 4: This shade can be used as a concealer. This shade will suit very people with very fair skin. Shade 5, Shade 6 and Shade 8: These shades are my go to concealer shades to be applied over my dark spot corrector. Shade no 6 is a bit yellow ideal for yellow skin tone people. Shade 7 and Shade 9: I use these shades as corrector to cut the dark spots and darkness near mouth and eyes. Shade 10 to Shade 12: These shades are contour shades which suit people across different skin tones. Concealer Shades: The concealer shades are not very effective and one requires a large amount of product to cover dark spots. I use the concelaer shades over the corrector and then it is slightly effective. The concealer does not stay for long. Corrector Shades: I use shade no 7 and 9 as my orange corrector to cover up darkness around mouth and eyes and also to cover dark spots. The corrector are good and effective, but should be applied in controlled manner. Also always blot the corrector with tissue and also give it some time to settle in the skin. The performance of the corrector is just average. Highlighter Shades: These are the best shades of palette. These shades are very effective and instantly highlight the face. I also use the highlight shade on my eye lids to neutralize the color of eye lids before applying eye shadow. Contour Shades: These are among the nicely pigmented shades of the palette. The shades are creamy but not easily blendable i.e. as soon as you apply blend them immediately else they are difficult to blend. Actually I really like the palette as it is very affordable and is good for practicing different looks. Anybody new to makeup and does not wants to spend so much should definitely buy this palette.